Interesting toys can be made from anything. Especially good as a material to construct all sorts of boxes. To please my baby the original home may including Smoking dad. If he had accumulated fifteen empty packs of cigarettes, you can make them a robot. 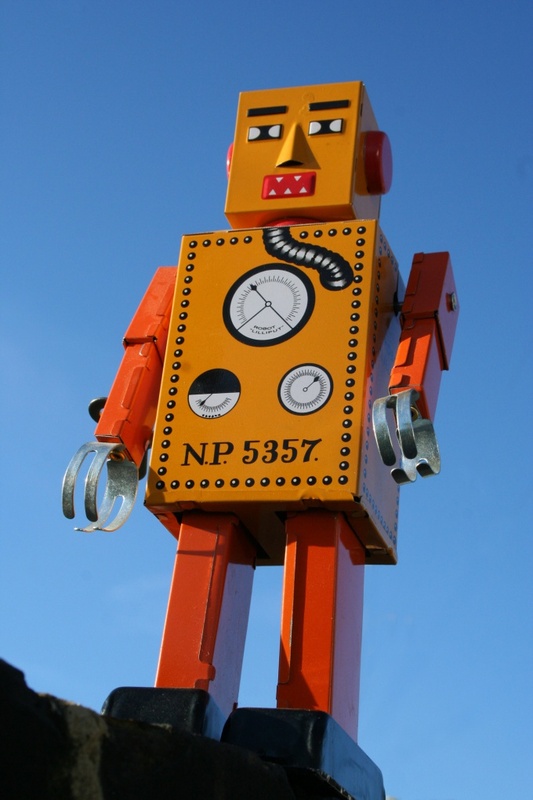 Construction robots can be very different, so they can be made of different number packs. Packs must be of the same shape and the same size, thus the size and shape of play no special role. Thin bundles will need more or robot from them will be smaller. Before you start to make harvesting different body parts of the robotand pull out the packs of foil and other unnecessary papers. Packs of align, torn seat cover with glue or tape. Cover seal too, as if the paper is not printed. For the head take 3-4 packs. Spread the large face of one of the packs with glue and align it with the same face of the other bundle. The second pack in the same way attach the third, then the fourth. To the best glue grabbed, pull the workpiece in multiple locations pharmacy gum. Glue the head of the robot. To do this, measure its length, width and height and make a scan of a rectangular parallelepiped, not forgetting the allowances for gluing. In principle, the robot can not paste over, but with foil it will look better. The bottom side that will be glued to the body, you can not paste. Similarly, glue the blank for the body of the robot. The difference is only that the billet for the body will be vertical, and the head — up horizontally on the edges of packs. You can make the robot higher, taping the first 2 identical blanks similar to the blank head, and then put one on the other. Blanks glued to each other across the young faces, it will have one top, one bottom. Glue the torso with foil, leaving open the top and bottom faces. Glue the head to the body. Put the torso so that the pack is vertically. The upper side of the spread adhesive. Put it on her head of the robot so that the bundles of which it is made, lay on the side. Let the glue dry. Make billet of the feet. Glue 2 packs of foil. One pack lay flat as will be the foot of the robot. If you decide to weight the legs, sand or clay must be put in this pack. Find the middle of the foot and glue it vertically to another pack. The short side of the bundles are arranged perpendicular to each other. Similarly, make a second leg. Glue the legs to the torso. To do this, spread glue on the top face of the workpiece the legs and align it with the bottom plane of the workpiece body. One of the side surfaces of the feet is a continuation of the side of the torso. Glue foil 2 pack. For high of the robot hand can be made of two packs, aligning one side surface with the bottom surface of the other. Short for robot it would only take one bundle in each hand. Glue the hands to the body as you like. Hands can be folded down — in this case spread the large surface of the hands and firmly press it onto the body aligning the shorter side of the pack with the shoulder. You can take the hands forward or backward, in this case, you need to spread the adhesive only part of the package. Make a robot's face. You can cut the "eyes", "nose", "teeth" out of colored paper, and you can use the colored tape to the foil it will stick even better. The body color on your own — there can be all kinds of lights, buttons, levers. Cartons of cigarettes should be cardboard, not paper. Feet can be something heavier for stability. As ballast suitable clay, clay, sand, cereals and other substances that can tightly fill the box. Foil is better to take paper-based, but in principle any suitable, even cooking.